Rochester Institute of Technology (RIT) is a private university located in Rochester, New York. The university has a vast network of dining establishments throughout the campus – from standard cafeteria-style restaurants in and around student quarters, to dining options within Gene Polessini Center, the new hockey arena where the RIT hockey team competes in home matches. In the hockey arena alone, there are a total of eight, multi-screen menu boards. BrightSign XD players feed menu content to the menu boards, but what sets this installation apart from standard installations is the ability to seamlessly integrate live “on-ice” streams of the game at critical points in the match. The screens are also used to play promotional content for upcoming events at the arena. In addition to the arena menu boards, nearly 20 additional players are utilized across the campus at various dining establishments. RIT had some very specific requirements for this installation. 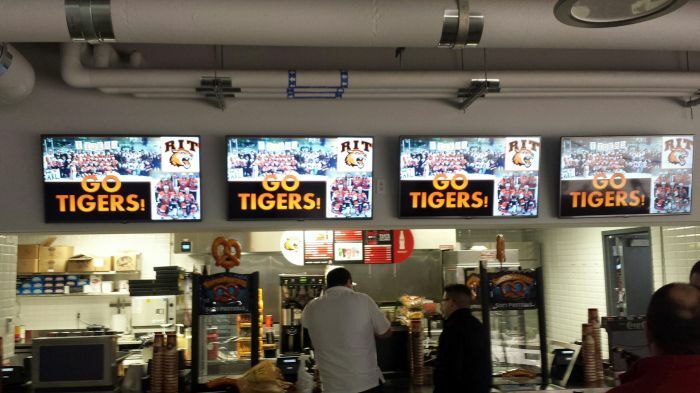 First and foremost, the university needed a digital signage solution for its menu boards that was cost effective, yet also offered management flexibility and reliability. Fusion Digital selected BrightSign’s players because they enabled RIT to manage all of their players under a single account, but also have multiple users from all over campus who could update their respective players remotely. BrightSign’s players allows each user to sign into the account and update their content from their own computer, at their own location on campus. Additionally, Fusion Digital has the ability to access RIT’s players remotely from within their offices, enabling them to offer a higher level of customer service and support. Since installation the players have performed flawlessly with zero downtime, not just meeting the needs of RIT, but far-surpassing them.